Well, I think I’m the only one that actually has a dollhouse to show you today from Emily’s original group of participants. I’m amazed though by the creativity and hard work that was put into dollhouses by the people following along with this whole crazy project! (Thank you, everybody.) Here are some of the people I’ve noticed, but please leave a link in the comments if I missed you. I bought a kitchen set and only intended to use the stove and fridge from it, but I ran out of time and just used the sink that came with it as well. I have a farmhouse sink that’s really cute, but it needs to be assembled. I’d also like to eventually make some cabinets and counters, sew a little skirt for the sink, and put up a backsplash. The dining wall also needs some large art, and a table! I rested a gift box lid on those little metal chairs. The light is a knob that I’ve had for years from Anthropologie, and the table settings and food all belonged to Brandon’s mom and grandmother. The paint color is Dill Pickle by Benjamin Moore. 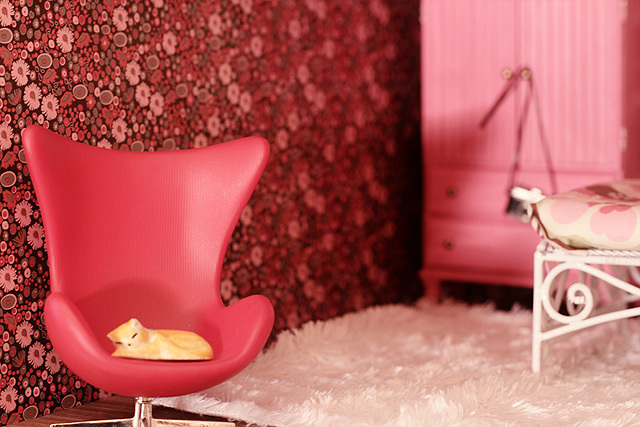 The tiny Jonathan Adler vases are from the Adler Barbie couch set we already owned for me Eleanor. The credenza is awesome and handmade, from OneFortyThree. It was my big furniture splurge in the dollhouse. The white wire chair is an ornament from CB2, and I already owned the mini Barcelona chair. The tea cart was a gift from Cassandra (thanks!). The gold folding screen and little accessories belonged to Brandon’s mom and grandmother. The wallpaper is one of my favorite things in the house. Tiny houses! I also had some amazing wooden flooring to go in the room, but it’s going to be labor intensive, so I left it white with a sheet of woven scrapbook paper as a rug. This room was going to be the nursery, but then I switched things around at the last minute. I already had the chair and chaise, but there’s no desk (oops). The accessories were in with the other little things from Brandon’s mom and grandmother. The rug and bookshelf were eBay finds. And eventually I’ll finish the stairs throughout the house. 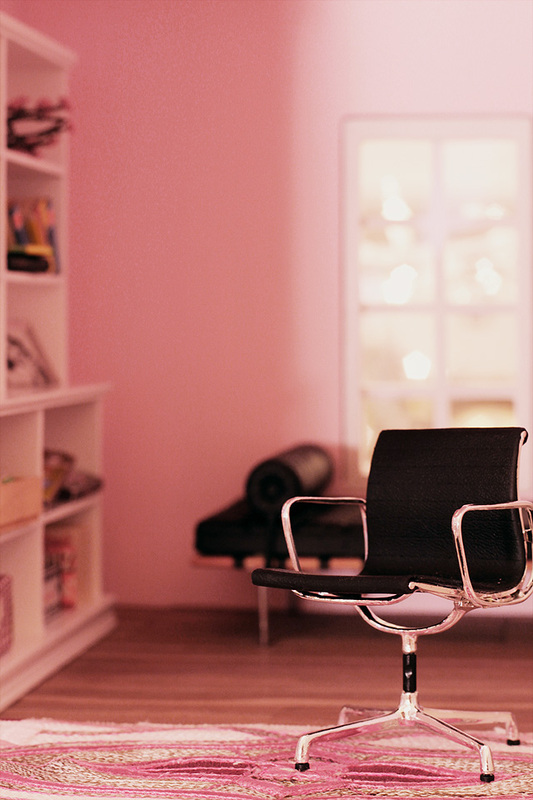 The paint is Ribbon Pink by Benjamin Moore. I showed you a lot of the bathroom before. The tile, dresser, and mirror were from eBay, and the slippers and ‘His and Her’ towels were from Brandon’s mom. I intended to sew bedding, spray paint the bed, and make some art for the room, but I ran out of time before the deadline. I made the rug out of leftover furry fabric from Eleanor’s Halloween costume. Again, I already had the chair, but added a kitty to sleep in it. I painted the dresser pink and hung a toy camera from the knobs. This was going to be an unfinished attic, and the kids’ bedroom was going to be what is now the nursery, but then I realized that the two beds wouldn’t fit in the other space because of the stair opening. I made the mattresses out of two pieces of foam core, sandwiched together with fabric on top. I intended to make bedding, crafty pendant banners, cute artwork, and so on and so on. This room is the least finished of all. There’s a wee dollhouse though! 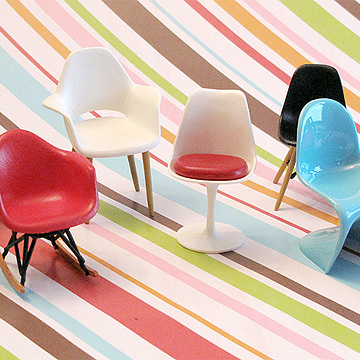 And an Eames rocker that I had. 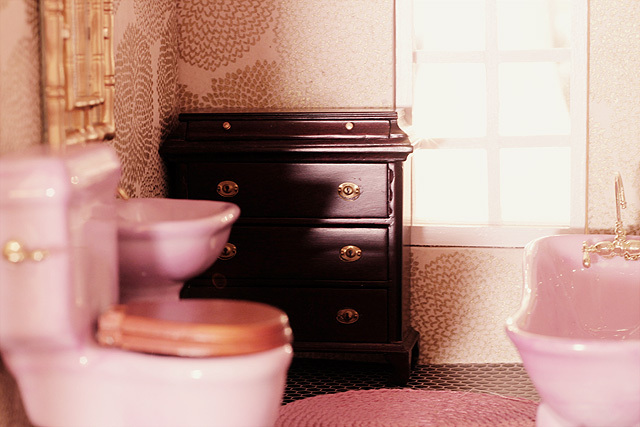 The paint is Benjamin Moore’s Pink Peony. The bird pattern is wrapping paper, and Eleanor chose the crib fabric. I had that white chair already, and the dresser was an eBay find. The rug is the same as in the kids’ bedroom and the living room: woven scrapbook paper. I will eventually finish the things I wasn’t able to get to, without the pressure of a deadline. Eleanor (and August, if he’s interested) is still young, so there’s plenty of time. I didn’t do the stairs, which I had put so much thought into, and I didn’t even touch the exterior! I’m really happy with the end result (so far) though, and Eleanor is over the moon about it. Awesome, awesome. Wonder how many people upon first glance would think this was real. It looks AMAZING! I want to live there. I think my favorite detail is the tiny cat napping in the bedroom! Great work, and I can’t wait to see it when it’s ‘done’ done! I can’t believe all those amazing iconic pieces you have in dollhouse size! Fabulous! I love it!!!! 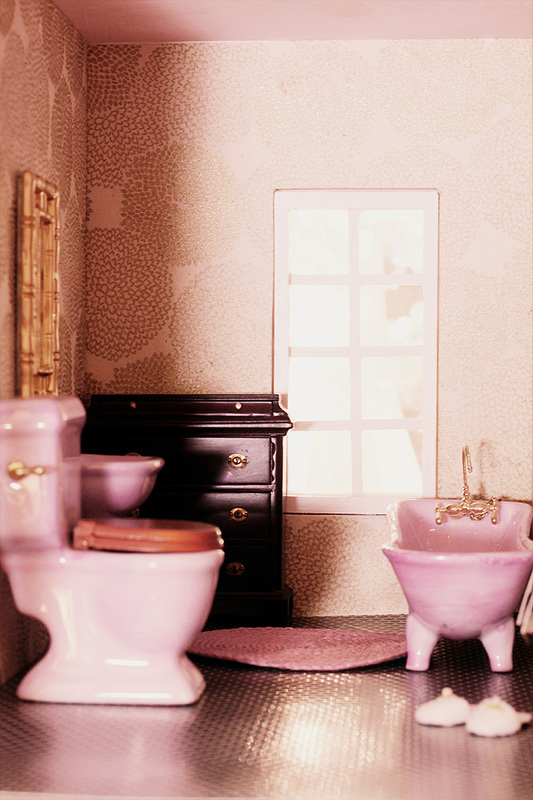 I would kill to have a dollhouse like that. My fav. detail is the bottle on the floor by the crib. So cute. 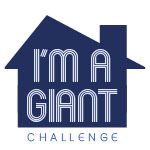 I hope the other participants finish up soon – someone will need to do one big post that shows all the houses. Like a dollhouse “walking” home tour. Job well done, as always! I love, love it! I have my old dollhouse still and I want to make it over SO badly! It looks great Nicole! Eleanor is one lucky lady! Ridiculously adorable. I want to live in it! …..so so so amazing! You are BEYOND creative! I scrolled thru and read-every-last-word…and looked at each picture for so long. 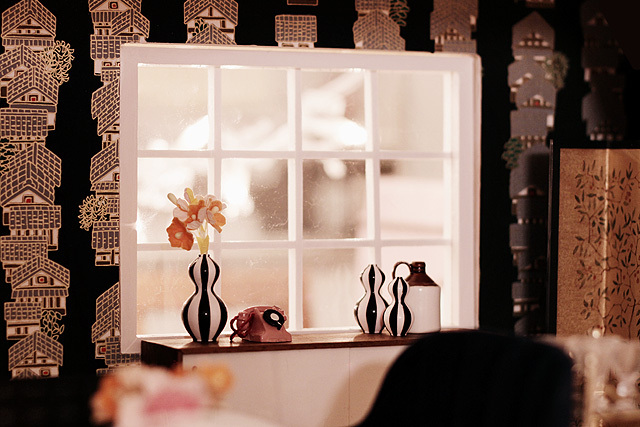 This 30 year old woman…..staring and living vicariously thru your doll house. awesome – absolutely amazing. Love the quality of the pictures too. I just wanted to point out a “typo” “sew a little sink for the skirt” I guess the words got mixed up. Oh, ha! I’ve fixed it, thanks. Oh my heaven, that is THE most amazing doll house I have ever seen. I just love the nursery room wall paper. It truly IS lovely! Well done!!! Nicole – that is adorable, just like your real house. i’m so glad you posted your pictures, i’ve been so excited to see everyone’s finished products. i got hung up on details and didn’t finish mine, but here’s what i’ve done so far. my new deadline is NEXT december, now that i understand exactly how much work is required. Its so darling, great job!! Wow! This is incredible! 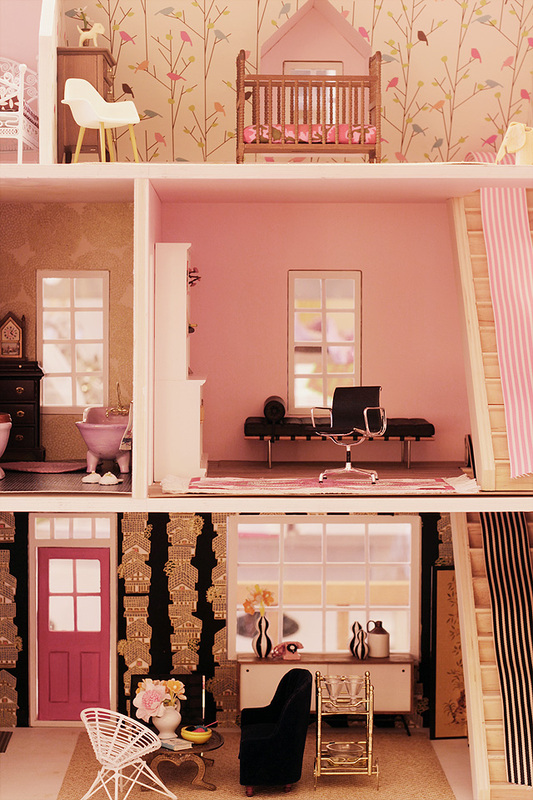 My little Eleanor would love to have a dollhouse like this too, when she’s bigger. She’s only 1 now but maybe I should get started! 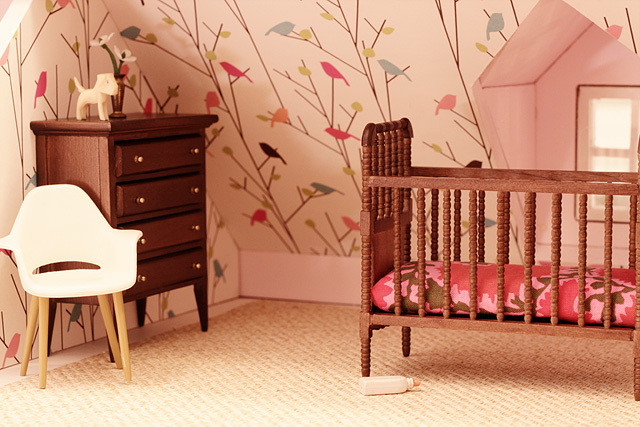 The whole house looks fabulous, but I LOVE the nursery–that wallpaper just looks so good. I’m so impressed with your house tour! I’m so inspired. Maybe when I go home for Christmas, I’ll pull out my childhood dollhouse again. This is incredible. Wow. You did such a fantastic job and I am sure Eleanor will treasure it forever. I really love the wallpaper in the living room. This looks so amazing! I I think my favorite things are the nursery wallpaper and the dark tile in the bathroom. You rocked it! And thanks for including me in your list. 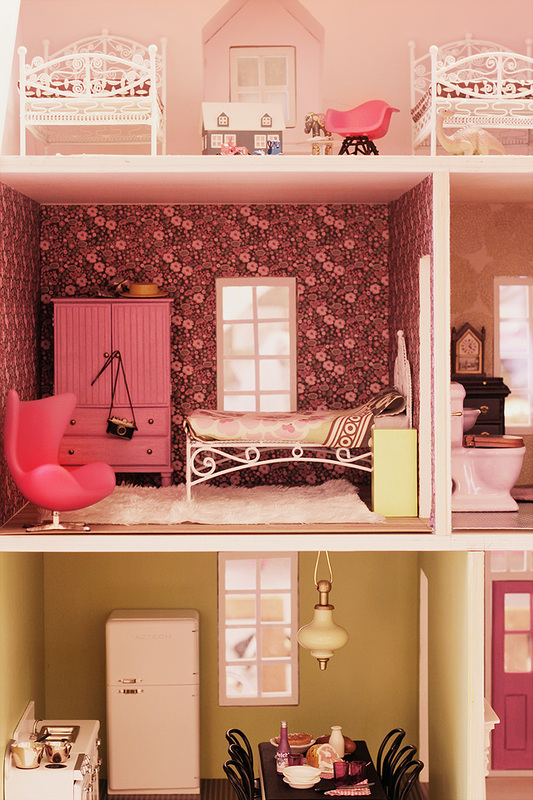 Yay for dollhouse-in’! YES! I wish I was doll-sized so I could live here. Amazingly pretty and creative. Wow! Some great purchases, interpretations and looks like you had a good source for all the little accessories. Its absolutely fabulous!! 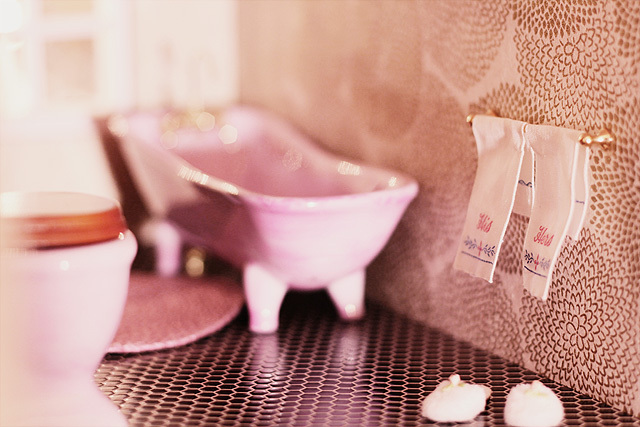 well done and just gorgeous – I love the colors and the bathroom is divine! Good job! 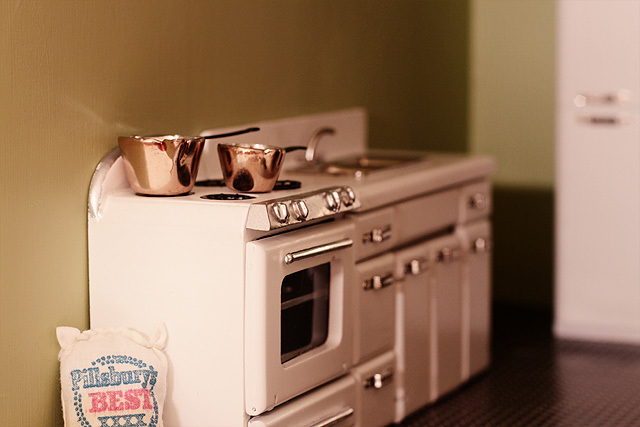 I LOVE dollhouses and have one that was handmade in Vermont – the exterior is purple and green and it was wallpapered with curtains – it still looks ok, though the curtains have yellowed. I will have to fix it up though at some point…your project is very inspirational! This is stunning and SO inspiring! My mother customized a doll house for me when I was a little girl and I have so many fond memories of playing with it. I hope your daughter enjoys this as much as I enjoyed mine. I am already getting ideas for my daughter’s doll house – and I’m only 5 months pregnant (and I don’t even know if I’m having a girl)! Great job! When you add to it & such, please show us. This is unbelievably awesome! I am normally way too lazy to comment but this is so spectacular, I couldn’t resist. I want to move in to this house. If this was a contest, I sincerely hope you win. You deserve it! This is seriously amazing. What a fun project! This is so incredible. I can’t believe you did that in such a short amount of time. Mine is as finished as it’s going to get for now. It still has a long way to go and I’ll keep working on it, but I put a few pictures up tonight. Oh fantastic! Your daughter is such a lucky little lass. You should also check Chinoiserie Chic, I think you would dig it. Between the two of you, I so want to run to the hobby shop. How hard was the pure construction aspect? Did the finishing and remodeling take long? Absolutely breathtaking. You did wonderful Nicole! Oh just thought of another question – kind of strange: So how many sheets of paper does each room take? Just wondering if I ever decided to take this on as a niece/nephew gift. Kind of like wallpapering in the real world! You did an incredible job! It’s hard to pick a favorite part, but the wrapping paper wall paper in the nursery really is amazing. The woven scrapbook paper as carpets is really deceiving as a photo. I would have really thought it was fiber of some sort. A family treasure for sure! Oh, I love this so much! Every room and detail is so perfectly thought out. I love how you’ve accessorized the place. But I think the my favourite part is how many of these items belonged to you or Brandon’s mom or grandmother. It’ll be such a treasure for Eleanor to have these mementoes of the women in her life. OMG! I love this so much. I always wanted a dollhouse when I was little, but the best I had was the barbie house I made out of a fridge box. LOL What a wonderful thing to be able to pass to your children! Really fantastic job – the unfinished bits don’t even look unfinished! I’m 21 and I’d be over the moon to be given something like this, so I just know it will be appreciated by your kids. It’s gorgeous! I’d live there. WOW it looks amazing!! I love all your wallpaper choices, and how it feels cohesive as a whole, but each individual room has its own unique flavor. All the little details are awesome. I’m so impressed that you pulled this together so quickly! And don’t forget me! I’m just about to post a few of my final pics. I don’t have time to edit all my photos tonight since it is way past my bedtime, but I’m proud of myself for actually finishing on time, yay! 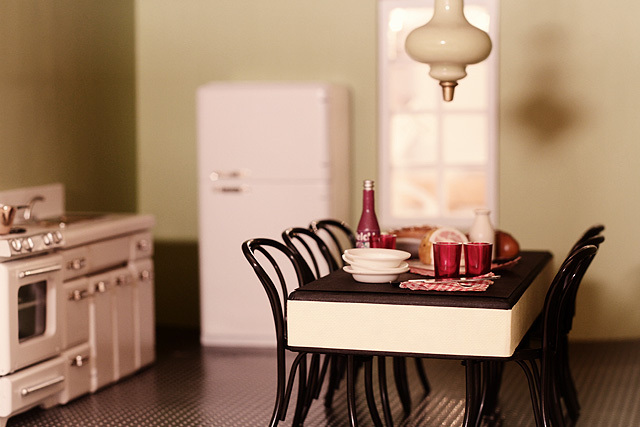 Lots more pictures of my little dollhouse will be up tomorrow! Wow! The dollhouse looks amazing! Nice work! Adorable. My boys have shown no interest in dolls or dollhouses, so this isn’t anything I will be able to do. Hmmm. I do have a 2 year old niece. Maybe in the next year or so I can start working on one for her! So cute! The decor totally looks like it blends with your home. I LOVE IT! Cute to the max!!! I studied interior design in college.. And have to do soooo much model for an interior space.. If only i could just do this one like yours it will be so much fun!! But when i was in college, making a model was the one that stressed me out the most! hahahaha! Congrats!! I LOVE the bird wallpaper. The house is absolutely lovely. Your kids will definitely get years of use out of it. I didn’t get mine 100% done in time for the deadline, but close enough. I’m so glad one of the original crew posted photos. I can’t wait to see what everyone else came up with. This is so incredibly, awesomely amazing! I’ve had a dollhouse for 25 years not nearly in such a finished state, and this definitely inspires me to start making one for my little girl. This is INCREDIBLE! Well done! You’ve been so clever with your materials, decorations and sourcing the furniture and stuff. The house actually looks LIVABLE! I’m so jealous and impressed. 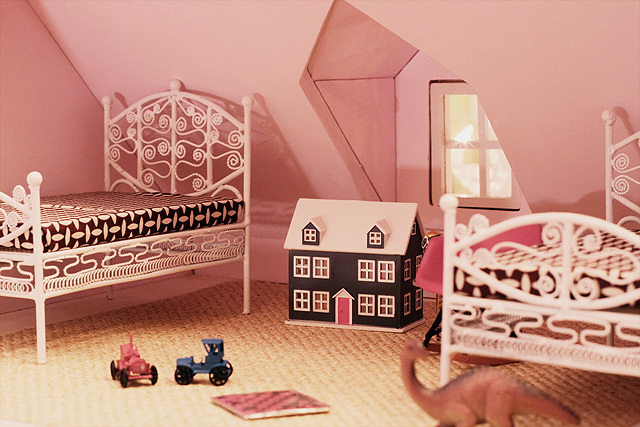 Hooray for dollhouses! PS. What are you going to do about a family to live there? I thought the one thing that really brought down my own dollhouse was the quality of the people figures (at that time; the early 90’s were not a golden age for dollhouse people), and I didn’t want such ugly dolls messing up my beautiful house. I’m curious to see what you come up with! It’s so beautiful!! 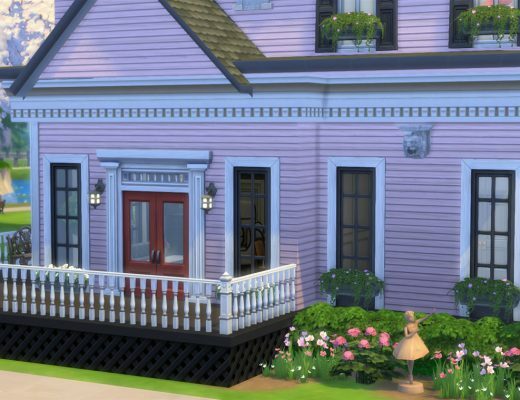 I’m having a hard time picking a favorite home – it’s all incredible! So, so sweet! I love all the wallpapers! Really excellent, gorgeous work! I see we both like the Paper Source…I always find something there! I like how you combined modern furnishings with more traditional ones. Congrats on completing it all on time (even though the challenge has been extended until Feb.!) Thanks for the mention about my blog, too! It’s fabulous. I do love the attic bedroom and the living room wallpaper! Wonderful job. I’m in L.O.V.E. It’s all fantastic! I’m sure your kids will spend many hours playing with this little house! 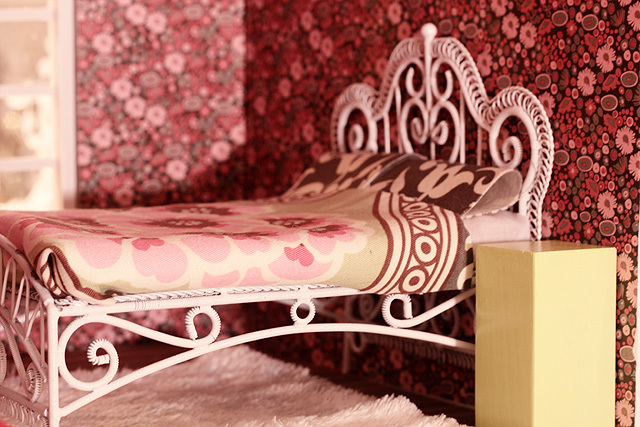 My very Chinoiserie Chic dollhouse is done and I have been showing one room a day on my blog Chinoiserie Chic. Stop by and see it. Yours is great. Love, love, love it!!! It is so sweet. Eleanor is one lucky girl. i love your dollhouse! especially love all the wallpaper you used! I’m drooling all over my cubicle! I’ve been silently observing as you pulled everything together. You’ve got a very lucky little girl! Your house looks FANTASTIC! I have that wallpaper in the bathroom too. Gorgeous gold! And good job finishing on time! I for one am glad the deadline has been extended. Stripping dollhouse wallpaper = no joke! That is crazy cool. Even “unfinished” as you call it it looks so neat. How lucky for Eleanor! I absolutely love this! Especially the kitchen! So CUTE! I also love how so many of the things in this house are exactly like their larger counterparts in your house! (Jenny Lind crib!!!) Great job! This is amazing Nicole! And so perfectly you. This is simply amazing! I have no better words for it, but amazing it is! Well its looks awesome of course!! You are lucky to have such cool chairs already, I am so glad you got to use them in the house! (I know you have had those for awhile.) Thanks for linking to my blog and sharing the other links. 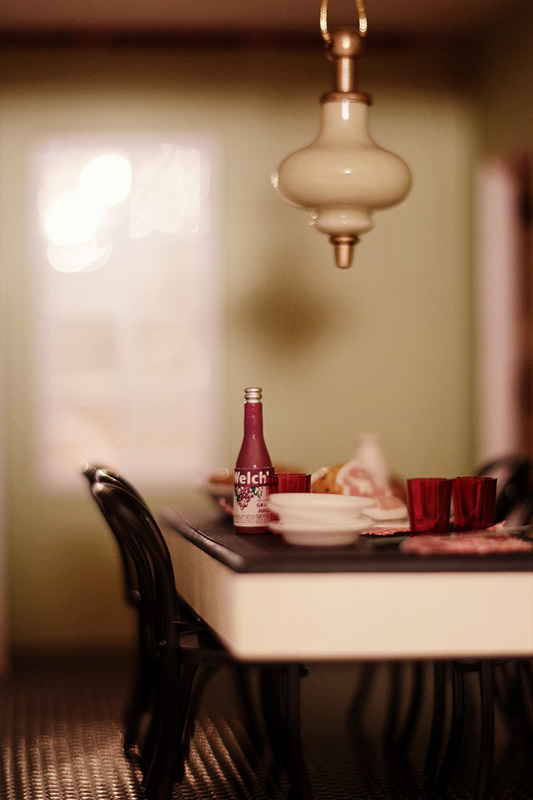 :) I love the little dollhouse, that has to be one of my favorite things. Also the doorknob as a light fixture! I probably should have started with the interior inside of the exterior. lol Oh well! This was still fun and now we don’t have a deadline. Absolutely adorable. What a wonderful thing you have done for your children! oh my goodness, I love it! so sweet and charming. Great job! I am freaking out about how freaking amazing this is. Seriously. 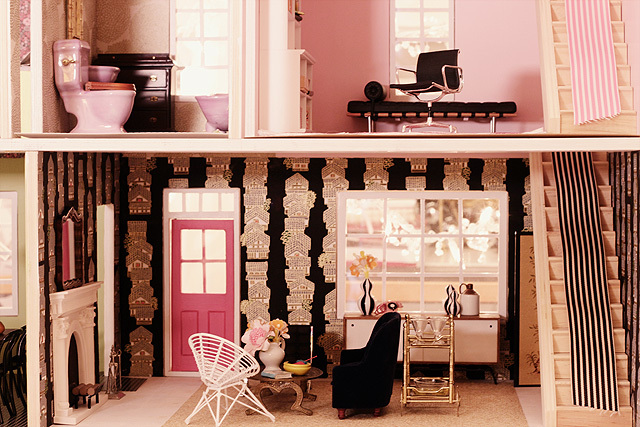 It’s the best dollhouse I have ever seen, hands down and VERY inspiring…for my REAL life house. Thanks for linking to our project, too! I appreciate it! This is so beautiful, Nicole! You did a great job. I’m sure Eleanor is going to love it for many years to come. 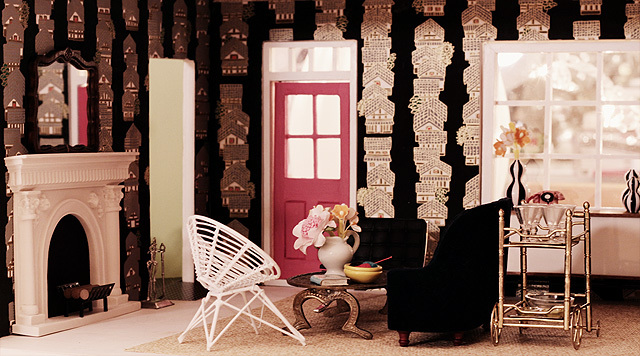 This makes me want to dive into a dollhouse-design project. Who needs children to have an affair with a dollhouse? So fabulous! I especially love that bird wrapping paper — wish it really was a wallpaper pattern! amazing and fantastic! what a special, special thing for your daughter! I kind of want to live there. My Love List No. 3 | Ciao Bella! Hi, found you via Poppytalk. That kitchen set! From ebay? 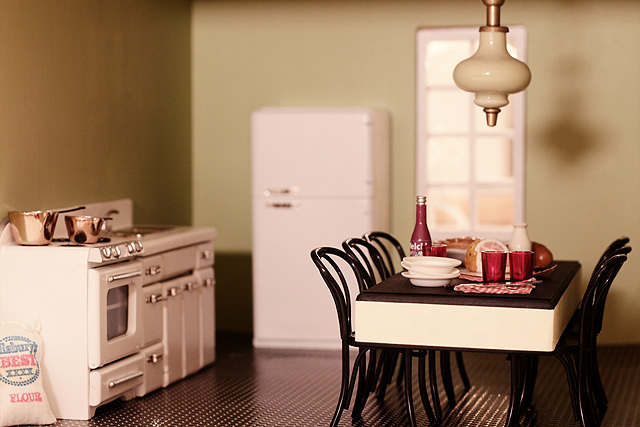 I have a dollhouse needing finishing myself (waiting until after the holidays) and I love that kitchen set. I probably have more things than will actually fit in but I’m sure I need a fridge and stove! Absolutely ADORABLE! Wow… I am completely jealous of the lucky dolls who inhabit this house. I’m just floored by your creativity and sense of style in the tiniest of places. So fun, so cute – I love it!! Amazing!!!! 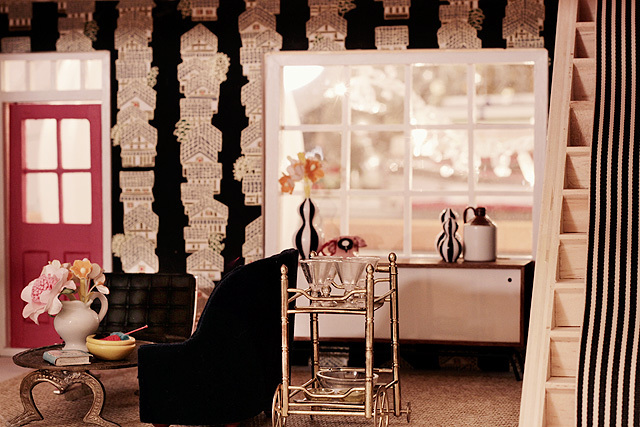 From the wallpaper to the adorable tea cart – it oozes style, creativity and love. I am speechless. Doesn’t happen very often. AMAZING. this is fantastic. you must have had so much fun making this. When I was a kid, my dad bought a basic dollhouse kit that he put together for me (I think it was made out of balsa wood – very basic). It was sort of the test run to see if I was even interested in having a dollhouse. He used rug remnants from my grandparents house. 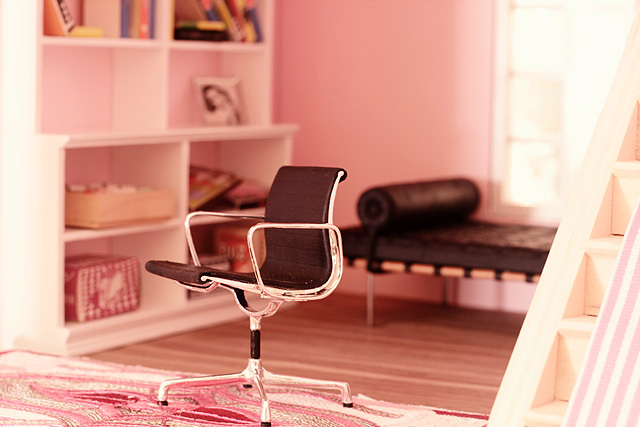 Since shag carpet was all the rage at that time, that’s what I got in my little doll house. So when I added little people to the house all the carpets came up to the knees. I LOVED that house so a few years later he built me a much larger dollhouse (this time with plywood). We spent hours together adding clapboard siding and stone work to the outside. Making Christmas cookies and a turkey out of Fimo clay. Picking out furniture, carpeting and wallpaper. I have so many fond memories of that house. Thanks for reminding me of the magic of a dollhouse. Yours turned out beautifully. Oh my goodness, I am so completely in love with this. Fabulous work, Nicole! I would love to live in that house, and short of that, would love to spend hours upon hours playing with it! Eleanor is so lucky to have such a talented, thoughtful mommy. This is the prettiest doll house I have ever seen !! I finished mine but haven’t written a post yet. I just love what you did. Very pretty but not too girly. I wouldn’t mind living there!